As I’ve effused about many times in the last few months, I’m in the delightful position of having some truly amazing fabric designs pass through my paws on a weekly basis. A look at any of our past videos should prove the point if you need convincing. The only lamentable thing is that I’ve so far been unable to purchase my favorite designs (some of which I’d snap up in a hot minute if I could). Offering users the option of creating storefronts is on our short list of features to add, of course, but we’re not there yet. 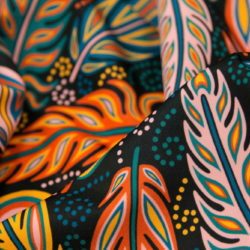 I’m happy to see that some of our resourceful users are finding a way to sell their Spoonflower printed fabrics anyway! Head on over to Junecraft, Sewbettie, and Nine Tomatoes for a peek at some of their lovely wares. Stash building, anyone? I’ve also got some fabric patterns for sale on Etsy…we’ll see what happens! Congrats on your new office, what a fantastic space!! I can’t wait to have a go at designing some myself! 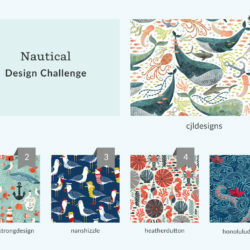 Can’t wait to see what Spoonflower comes up with! thanks so much for the attention kim! you’re the best. Well, I’m not exactly offering FABRIC for sale, but what I’m doing is creating pattern tiles for people to purchase as a TIFF file, ready for uploading and printing by you wonderful Spoonflower people.